Fun and friendly, colorful and informative, a travel show offers attendees not just a wealth of information but experiences that will make you want to see more of the world. In cities large and small, travel experts and exhibitors convene at these shows for the public. They all have a single goal: to inspire you to leave home and visit the part of the world they represent. Discover what awaits you at the show. Every travel show has an area where representatives of destinations, cruise lines, hotels and others in the industry set up colorful booths. These are excellent places to get information. 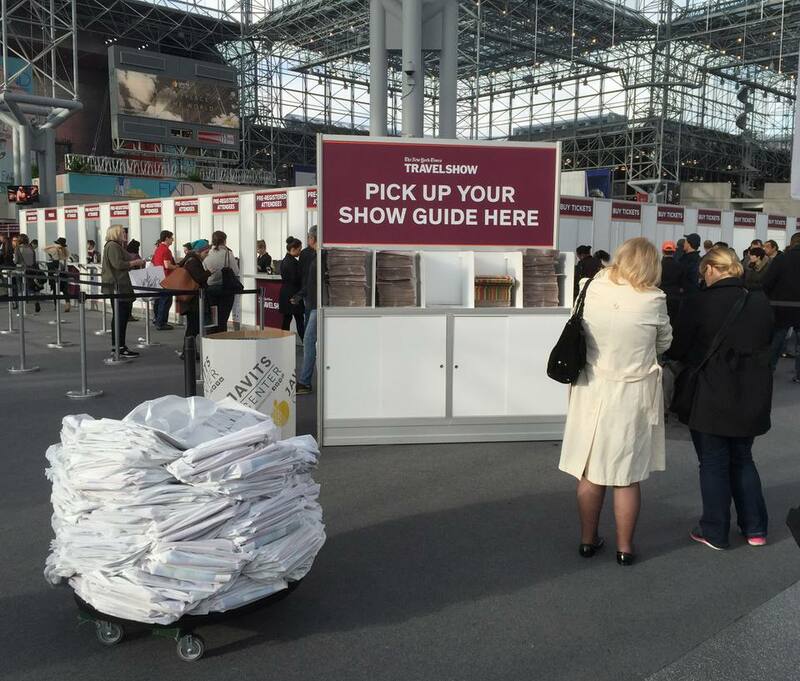 In fact, there's so much material available that there's a good chance you can get a free logo bag to hold the paper and goodies the people at the booths distribute. If it's a big show, take a copy of the floor plan and study it so that you'll be sure to visit booths that interest you. And check for a schedule of seminars that you can attend. At many travel shows, seminars led by experts are part of the appeal. Attendance is free with admission. This seminar at The New York Times Travel Show featured a panel of travel agents discussing the topic of Small Ships, River Cruises, and Barge trips. When you compare big ocean cruises versus river cruises, it's easy to see why more and more experienced travelers are opting for smaller boats that sail close to shore. Tip: Always sit in the back of a free seminar. The level of knowledge of the speakers and quality of their delivery varies widely, so you might want to make a quick and unobtrusive getaway. People behind the booths are generally well versed in the company they represent and can answer your questions or direct you to a source who knows more. AmaWaterways is an upscale river cruise line that competes with Viking River Cruises. To see what it's like to sail with this brand, read AmaWaterways' Tulip Time Cruise. Available for just six weeks a year, this itinerary is an opportunity to immerse yourselves in the Dutch lifestyle (windmills - cheese - wooden shoes!) and visit the magnificent Keukenhof Gardens when the tulips are in full bloom. Overwater bungalows have long lured lovers to Tahiti and other exotic islands. Recently, though, they're opening in the Caribbean. Sandals Resorts, which is so popular with honeymoon couples and other romantics, is introducing this type of accommodation at Sandals Royal Caribbean, the brand's flagship resort in Montego Bay, Jamaica. Learning about a different culture is one of the most alluring aspects of visiting a foreign country. At a travel show, entertaining representatives of a country may communicate their unique culture through music and dance. At the 2016 New York Times Travel Show, dancers from Malaysia were among the performers. A travel show is an optimal setting to learn about trips that appeal to your interests as a couple. These side-by-side signs were designed to attract foodies by offering gourmet tours to Italy, where visitors could focus on truffle hunting or follow their noses to the best cheese and prosciutto in Bologna. To make things even more exciting, a booth at a travel show may offer a contest or sweepstakes to win a trip. Why not take a chance? In most cases, entering these contests is free. Do know that by providing your email address and phone number to enter a contest, you may be solicited by the contest sponsor if you lose — and they'll want to entice you to take a paid trip to the destination. Depending on the show that you attend, there may be an opportunity to bid on hotel rooms or vacation packages. If you bid wisely and win, there's a good chance you can pay for a stay at less than the going rate. Attendees at The New York Times Travel Show were able to bid on hotel rooms in the British Virgin Islands, Cayman Islands, Curacao and elsewhere in the Caribbean. Even if you're not interested in what the people are selling, take a seat and give your feet a rest. Travel shows may be held in gigantic spaces and all the walking and talking you do could get tiresome. And if you are interested in the product, there's a chance that you can buy it at a discount or special show price. Let's face it: The reason companies exhibit at these shows is to capture your attention and get you to want to learn more about their destination or product. So every once in a while you'll encounter a larger-than-life character. If you want to take a selfie with he/she/it, don't hesitate to ask and smile wide. What's that tantalizing smell? Some exhibitors offer small, complimentary tastes of a dish or two that exemplify their country's cuisine. If you're still hungry, there's usually food service available where you can pick up a drink or snack. Like any industry, the travel world has its celebrities. People such as Michael Palin, Anthony Bourdain, and Rudy Maxa attract TV audiences. Andrew McCarthy, a TV star in his youth and a popular director now, is also an award-winning travel writer. There are also plenty of online travel celebrities. Johnny Jet, for instance, travels around 150,000 miles a year, has been to countless countries and has a popular website and newsletter. And the last time we bumped into him, he was surrounded by admirers after giving a seminar at The New York Times Travel Show. One of the best-known names in the travel industry is Frommer, thanks to the handy and trustworthy guidebooks that have led people all around the world. It's a family business, started by the peripatetic Arthur Frommer and his daughter Pauline, now editor in chief of the guides and host of a weekly radio show. After giving an informative presentation (see sample on the next page), the duo took time to meet fans and autograph their books. The Frommers' presentation offered a wealth of information based on research and current trends. This slide, for example, shared their tips on the best times to purchase airline tickets to get the lowest fares. Given how inspiring a travel show can be, that's extremely useful information.